If I had to name a handful of my favorite and most commonly made dishes, zucchini marinara would have to be among them. This dish is a staple for me, and as with all staple dishes, I modify it according to what I have in the fridge. Sometimes I top it with creamy chunks of avocado, sometimes with baked tofu, sometimes with hempesan or toasted walnuts. Mixing lentils into the marinara sauce is lovely, as is guacanara, if you’d like a thicker sauce. Baked parsnips and butternut squash also make a lovely addition. 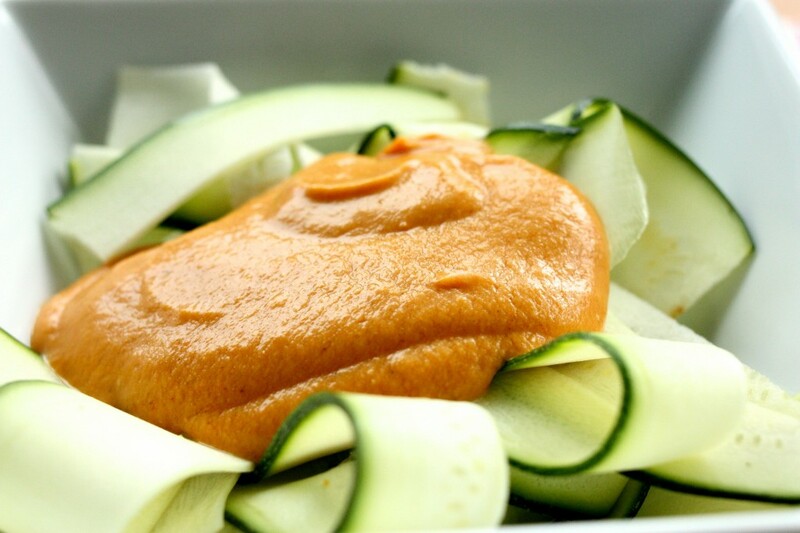 You can check out the recipe for my classic zucchini marinara here. 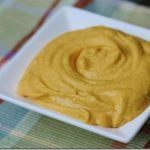 Tis the season for all things pumpkin, so I recently thought I’d put an autumnal twist on my beloved recipe. 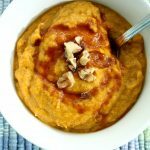 I did this by blending up cooked pumpkin puree, fresh tomato, soaked cashews, a pitted date for sweetness, some sea salt, and a touch of nutmeg. While I’d imagine that this sauce is a bit of an acquired taste, it’s probably not all that acquired. I know I’m not the only savory/sweet lover in this audience, and I remember being surprised at how many other folks loved the combination of peanut butter and tomato when I shared my peanut butter and tomato sauce. 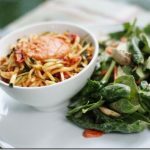 When it comes to zucchini pasta, cashew alfredo can sometimes feel too rich, while marinara on its own can feel a little too light. This sauce is a pretty stellar in-between. Hopefully you’ll enjoy it, too. Optional flavor add-ins: cinnamon, nutritional yeast, oregano, sundried tomato, almond butter, red wine vinegar, or anything else you like! 1. 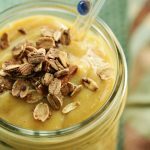 Blend the pumpkin, tomato, cashews, nutmeg, salt to taste, dates, and water together in a high speed blender, along with any other additions you like. Add more water if the sauce is too thick for your taste (I enjoyed mine thick for this recipe). 2. Dress noodles with the sauce. Add any additional toppings that suit you, and enjoy! 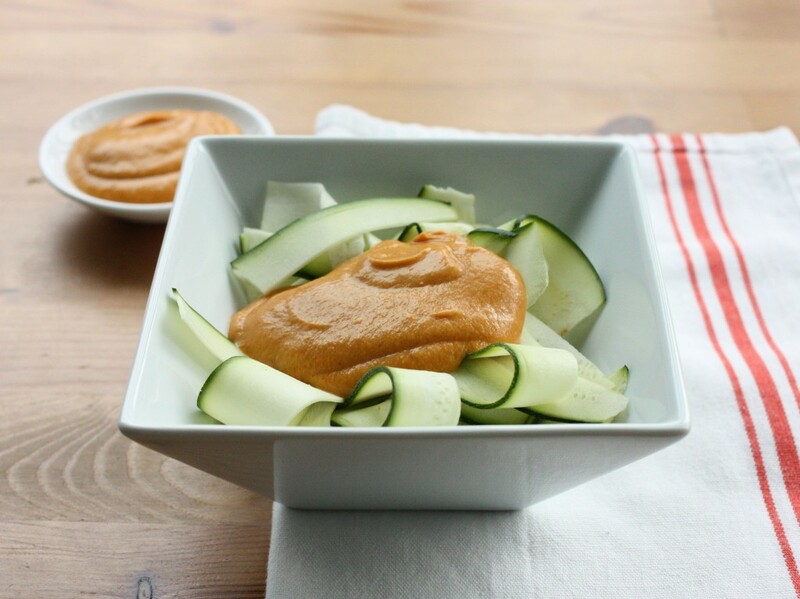 Save extra sauce for leftovers, or to use as a veggie dip. And this, my friends, is an express post, because I’m writing from a bus that’s pulling into DC right about now. Thanks so much (as always) for your thoughtful responses to my Weekend Reading posts! I’m happy that you’re enjoying them. Speaking of series, it’s been very quiet lately as far as Green Recovery submissions go. Know that I’m always excited to get new voices, so if you have a story to share, feel free to email it to me at [email protected] The guidelines are flexible (you can pretty much structure it however you’d like to), the length is flexible, and you can absolutely remain anonymous. Love this idea, and wish I’d had it when the zucchini was growing like weeds last summer! And I would love to read more Green Recovery stories–it’s one of my favorite things you do on the blog. I love hearing that. Hopefully I’ll have some new submissions soon! Happy Monday to you! Hope all is well in DC. yuuuum. agree about the cashew alfredo..that stuff is rich! i can only eat a half portion at my local raw vegan eatery. but yes…a simple tomato sauce and i’m still hungry after dinner, i need a bit more substance in my sauces. tis the time for pumpkin overload anyway right 😉 i think i get more vitamin A in the fall than any other time of year lol. 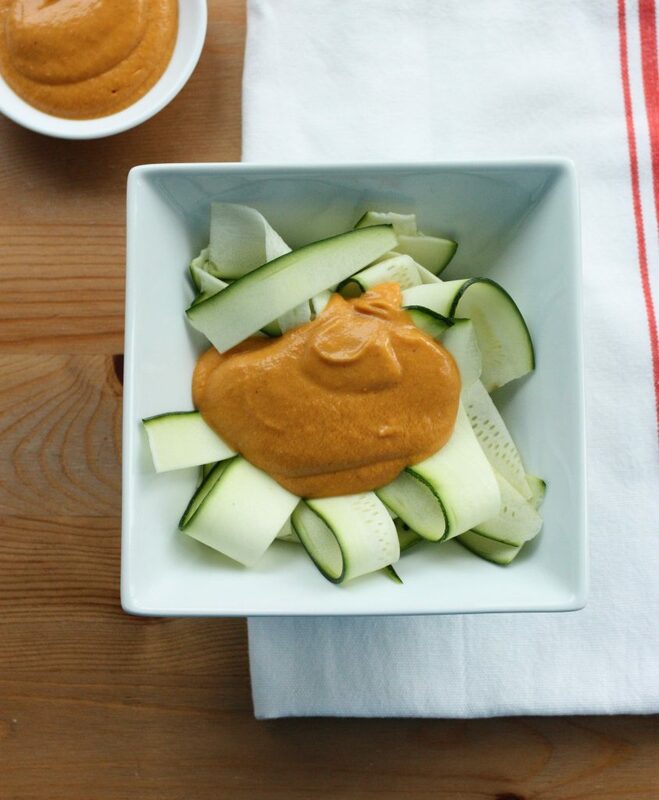 I haven’t made zucchini marinara in forever, love the Autumnal twist on this! This looks gorgeous. I’m a huge fan of sweet/savoury and often forget that not everyone has the same tastes as me! I missed that peanut butter and tomato sauce, but it looks like a must make as well. I have made zucchini pasta before and it turned out great. However this pumpkin tomato cream sauce just looks delicious and perfect for this time of year. This looks so yummy! It even looks warming for autumn given the pumpkin and the warming spices and the creamy comfort of cashews. 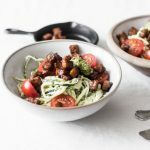 I’ve made zucchini pasta before but could never get my zucchini nice and thin and uniform. I would like to invest in a mandolin slicer. There have been so many times I have made something knowing that it would have been much better if whatever it is were sliced thiner. You could try just using a veggie peeler. Far less deadly than a mandoline. I made this last night but added more pumpkin to mine (maybe 1.5 to 1.75 cups pumpkin. I loved the sauce and turned the leftovers into a soup today by adding broth and lentils. I didn’t care for it over the zucchini though. Very creative combination!